At Car Clinic MOT Centre, your Ellesmere Port garage, we don’t just do MOTS. We also supply tyres from all the leading manufacturers. You may not be familiar with Vredestein tyres, so here is some background on the brand. Rubber has been in Vredestein’s blood since the start of the 20th century and is part of their DNA. This has made them a leading European manufacturer of first-class tyres. Vredestein is one of the oldest tyre manufacturers in the world, with a history that goes back more than a hundred years. Innovation is their foundation: it is crucial to staying ahead in the tyre making business. Their pioneering spirit powers them forward and motivates all their expert staff to make some of the very best tyres on the market. Major strides have been made in tyre safety, handling and fuel economy. As the connection between your vehicle and the road, your tyres are essential if systems such as ABS and ESP are to work well. Each year, Vredestein’s R&D professional study thousands of test miles to find the perfect tread, rubber compound and the core structure. The result has led to them receiving top marks in independent tyre tests in Europe. Vredestein has a very clear vision of how a tyre should look, and they have partnered with the famous Italian design house Giugiaro since 1997. 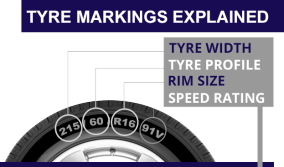 They devote a great deal of much attention to the tread design and sidewalls of their tyres. This symbolises their attention to detail and commitment to setting themselves apart from the crowd. The qualities are reflected in the technology of the tyres and also their design. Giugiaro’s signature underscores their distinctive character. The Italian design takes shape in close cooperation with the engineers at Vredestein’s R&D Centre: form always follows function. For your free Ellesmere Port car repairs quote or Ellesmere Port tyres quote just give Car Clinic MOT Centre a call on 0151 3390101 or pop in at your convenience.